The chart above shows my measurements of sky brightness at three different sites in Oct/Nov 2010. The first night was at the Ice In Space Astro Camp (IISAC) at Lostock, north of the Hunter Valley in NSW (Sat 9th Oct). Next up was the VicSouth star party at the remote Little Desert Nature Lodge in western Victoria (Thu 11th & Fri 12th Nov). A few nights later I followed up at the Astronomical Society of Victoria's Leon Mow Dark Sky Site in central Victoria (Mon 15th Nov). Through each night, I captured a rolling series of 30 second exposures at ISO3200 with a Canon 20D and 50mm f1.4 lens wide open. I used a digital inclinometer to point the camera 37 degrees up due south. Back home, I cropped each image down to a 100 by 100 pixel square from the centre of the image and then used IRIS to report the median pixel value for the crop from each 30 second image which is plotted above. The maps below from Australian Dark Sky Locations show these three sites against the World Atlas of Artificial Night Sky Brightness. LMDSS and Lostock are in the grey zone ('Typical truly dark site') while VicSouth is in the black zone ('Excellent dark-sky site'). Looking first at the results from VicSouth and LMDSS, there is trend down in sky brightness values early in the evening, which is a result of the milky way and zodiacal light setting in the west. Remember that the camera is pointing due south and the sky measurement is taken nowhere near either of them - just the scattered light from the milky way and zodiacal light is increasing the brightness of the entire sky by 10-15%! The picture below shows both the milky way low on the horizon and the zodiacal light in the centre of the image angling up to the right. We don't usually think of these features actually lighting up the rest of the sky but it's not hard to imagine that they do. Because IISAC was one month earlier than the other results, the milky way set two hours later, so the downward trend in the graph occurs two hours later in the night. Venus also contributed to the early brightness of the sky at Lostock. Clouds on the Friday night at VicSouth and more frequently at IISAC in Lostock show as larger spikes downwards as they block the light from the sky. This makes the Lostock results a bit harder to intepret but there probably is some additional contribution from the lights of the Hunter Valley towns and power stations. The Leon Mow Dark Sky site starts off significantly brighter than the VicSouth skies in Little Desert National Park. Later on though the values are very much the same. I think this variation is due primarily to significant changes in brightness of the 'airglow' rather than artificial lighting. I'll come back to this.. Noise levels in the camera over the 30 second exposure make up about 1% of the levels recorded, but the variation in noise between the nights is much less than that (there was not a significant temperature difference between the four nights). The images were at approximately the same focus each night but even grossly out of focus images only change the result by 1%. Changing how high in the sky the camera points affects the sky brightness reading but I'm confident it has been done accurately enough to keep that error also to the order of 1%. Brightness measurements drop off quickly away from the centre of the image but all measurements have been taken close to the centre. I'm confident that the total experimental error is less than 5%, and probably more like 2-3%. Light pollution is evil. It is entirely wasteful and damaging and good lighting standards should be in place to greatly reduce it, so that outdoor lights shine where they are needed without spilling into the night sky. Despite the very poor quality of outdoor lighting standards, here in Australia we are very fortunate to have a lot of truly dark skies. But I think we've become so paranoid about light pollution that we start seeing it in places where there actually isn't much at all. 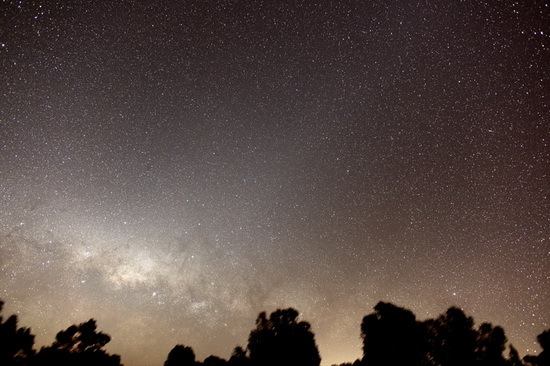 In the image above of the western horizon from LMDSS, light pollution from Bendigo is visible low on the horizon between the trees on the right, mixed in with the light of the milky way. This does have a real impact low in the western sky and the small light dome in that part of the sky degrades the aesthetic quality of the site somewhat, but across the rest of the sky it is insignificant compared to the natural brightness of the sky. I remember on my first trip to the Leon Mow Dark Sky Site sixteen years ago that people were commenting on the brightness of the sky in the west and worried about the lights of Bendigo, before somebody else pointed out that it was zodiacal light. I think this is still a reasonably frequent mistake - the diffuse light of interplanetary dust in the solar system being unfairly attributed to light pollution from Bendigo! Later in the evening at VicSouth on the both the Thursday and Friday nights, I could trace the zodiacal band all the way across the sky, with Gegenschein easily visible above and to the left of the Pleaides. (The Gegenschein is a bright patch on the ecliptic opposite the sun where preferential backscattering of sunlight causes a larger and brighter patch of light along the zodiacal band). On the Monday night at LMDSS, the visibility of the zodiacal band and Gegenschein was every bit the same - I could not judge any difference visually between the two sites. If you have not seen the Gegenschein and Zodiacal Band before, I recommend looking for them. They are not as bright or obvious as the milky way, but quite easy to see once you know what to look for. I think they are one of the best tests of the quality of a dark sky. With well dark adapted eyes, the sky at night can seem quite bright, but if you can see the faint light of the Gegenschein then there must not be very much artificial light! It turns out there a number of natural as well as human contributions to the brightness of the night sky. Even most amateur astronomers underestimate how much natural sky brightness there is, which places a very real limit on how much darker your skies can get by travelling for days into the middle of a desert. Airglow (also called nightglow) is the very weak emission of light by a planetary atmosphere. In the case of Earth's atmosphere, this phenomenon causes the night sky to never be completely dark (even after the effects of starlight and diffused sunlight from the far side are removed). Airglow is caused by various processes in the upper atmosphere, such as the recombination of ions which were photoionized by the sun during the day, luminescence caused by cosmic rays striking the upper atmosphere, and chemiluminescence caused mainly by oxygen and nitrogen reacting with hydroxyl ions at heights of a few hundred kilometers. 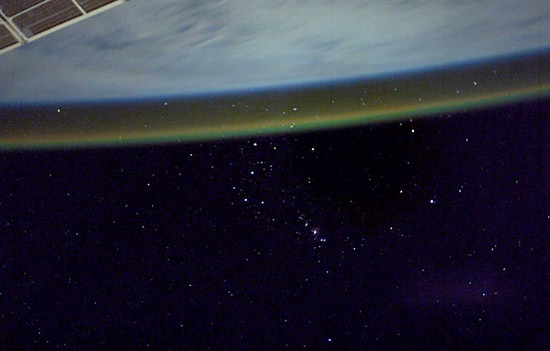 Below is an image of airglow from space - it's very real and a long way up! More airglow images and information available at http://www.atoptics.co.uk/highsky/airglow2.htm. To make things more complicated, airglow is not constant. Disturbances in the atmosphere (confusingly called 'gravity waves') create structure and considerable variation in the airglow. I have turned the image sequences which I used to generate the results above into small videos below. The first video is from the Thursday night at VicSouth in Little Desert National Park. The variation and structure in the airglow is hard to make out on the Thursday night but especially later in the video it is still clear. I would characterise this as a 'typical' level of airglow. In the second video from the Monday night at LMDSS, variations in the airglow are prominent and even the colour variation between red and green is visible, particularly later in the video. This is a little reminiscent of aurora but it is a different mechanism and a much fainter phenomena. Lest you think I am making all this up, well known astrophotographer Jerry Lodriguss has some similar videos of airglow and gravity waves on his website. He also has published on his site a more comprehensive discussion on just how dark the sky can get by Brian Skiff from 2001. Looking back at the results, I think that the reason the LMDSS measurements were significantly higher than VicSouth in the early part of the evening, and becoming so again later in the night, were due to periods when the airglow was brighter than average. There were several hours where the results from both sites were very similar (with a sample of two nights at VicSouth) which would not be possible if there was a significant contribution from light pollution at LMDSS. Looking at the videos, it's easy to see that the high frequency 'noise' in the charts is related to structure and bands in airglow, and that there is considerable variation in intensity over a period of hours as well. Hopefully you agree that these measurements of sky brightness are very sensitive and objective. My eyesight is not sharp enough to do critical limiting magnitude surveys, but I think it would difficult for any visual observer to match this kind of sensitivity. More importantly, any single measurement of sky brightness is subject to considerable variation in airglow (and whether bright parts of the milky way and zodiacal light are also present). To compare sky brightness between different sites requires at least a large number of measurements, preferably over multiple nights. Since airglow occurs 100km up in the atmosphere, there's not much you can do to escape it (although it is worse at high geomagnetic latitudes). 'Transparency' and 'Seeing' are two completely separate aspects of the quality of the night sky. Observing from higher altitude locations is one of the best ways to get better transparency, which will improve visibility of objects particularly at lower elevations in the sky. Even 1500m puts you above a lot of the dust and junk in the atmosphere. Once you get to a 'true dark sky site' limiting magnitude estimates may say more about transparency than they do about any residual artificial light or even variations in airglow. 'Seeing' is an even more complex topic which I will not attempt to discuss here! 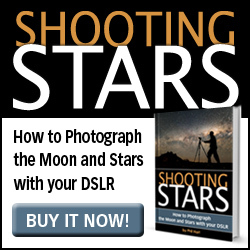 I'm a (mad) keen astrophotographer and I regularly travel two hours from my home in inner Melbourne to the Astronomical Society of Victoria's Leon Mow Dark Sky Site in central Victoria. I believe these results show that any artificial contribution to the sky brightness at LMDSS (other than low on the western and southern horizons) is barely measurable compared to the naturally varying brightness of the night sky, primarily due to airglow. Looking at the World Atlas of Artificial Night Sky Brightness maps, the black zone starts the same distance NW of Bendigo as LMDSS is to the NE. Despite a couple of smaller towns further NE and SE, it's not hard to see that the satellite measurement at this location may have been close to its limit of sensitivity and must be very close to the 'black' zone. I think this comment applies in general too.. if your site is well inside the grey zone on these maps the overall brightness of the sky is likely to be governed more by the amount of airglow on any given night than by any residual and all but immeasurable contribution from artifical lights. As my Scottish friend would say.. clear, dark and steady skies! Photo of the LMC materia bridge? Hi Phil! 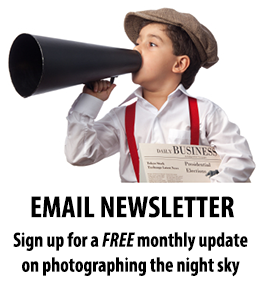 I just read your article about the "airglow and other thoughts on dark sky sites". There is a phenomenon in the southern skies of which I have never seen a photo, the so called LMC materia or light bridge. See my thread on IceInSpace. Do you have the possibility to take an image of the light bridge? Its surface brightness is about as dim as the faintest part of the zodiacal band and it goes between the LMC and the Milky Way in Triangulum Australe (almost 40º in length). I observed this light naked eye from a true dark site (Bortle class 1, black zone) in Western Australia last December. An interesting topic Phil - very well presented.